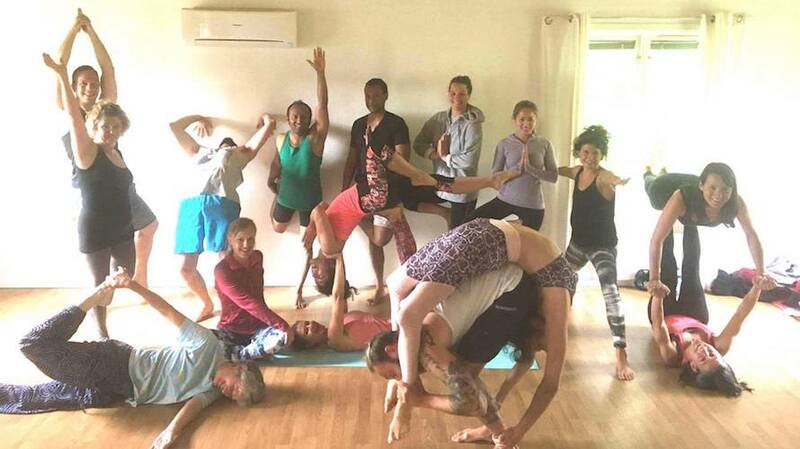 Now into it’s fifth year UpSideDown Yoga Holiday, proves to be an eclectic platform to advance your Yoga practice, explore the creativity of AcroYoga, rejuvenate with Thai Yoga Massage plus allows real social time for yogis and yoginis to interact! 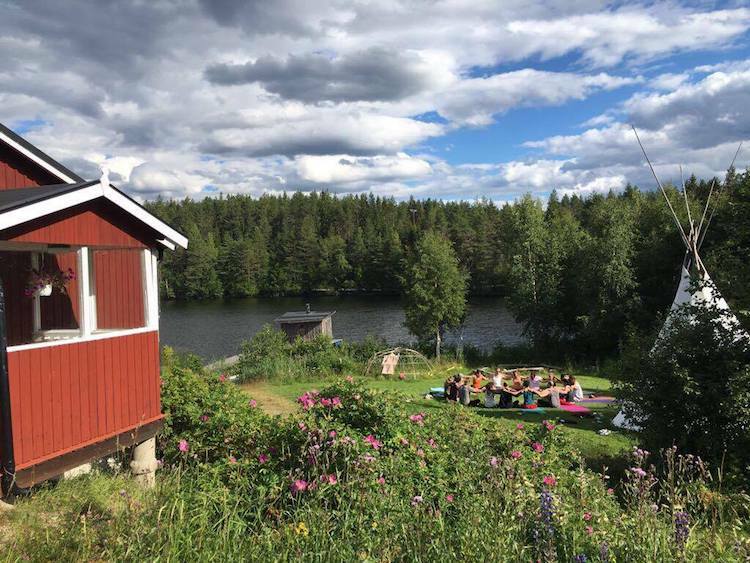 This coming July, we are hosted by the world famous ‘Shambala Gatherings’ retreat centre, quietly situated in a Swedish forest surrounded by tranquil lakes. 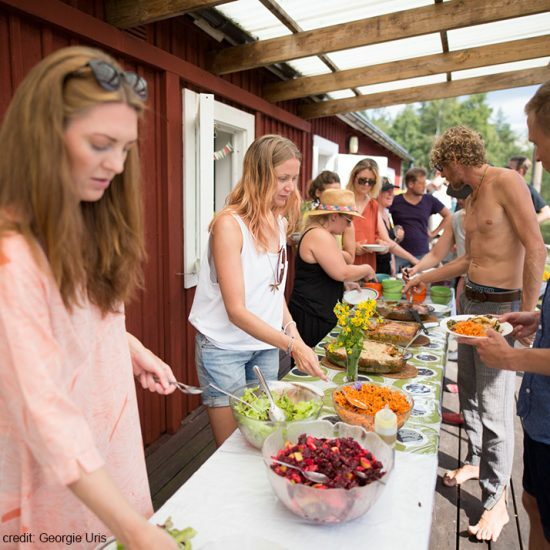 Shambala is particularly renowned for the community feel that is created when ‘strangers quickly become friends’, for the wholesome vegan food made from local and mostly homegrown organic ingredients, and its beautiful location in Nordic nature . Other features of the centre include the availability of a variety of massage treatments and the use of their sauna. UpSideDown Yoga Holiday is co-run by Catie Foroughi, creator of CYoga, ieva Wildlovebeamer, AcroYoga teacher, European teacher trainer for Rainbow Yoga and founder of Wild Love Beamer, plus her partner and AcroYoga base, Dino. UpSideDown Yoga Holiday’s focus is to support you in your growth in your yoga journey, create space for you to relax, and connect to nature & like-minded yogis and yoginis. There will be two Yoga sessions a day, meals provided and ample time to rejuvenate and explore our beautiful location. Our retreat centre this year, Shamabala Gatherings, is great place to awaken your inner wild and free spirit by exploring the surrounding beautiful lush forest and lakes, enjoying the evening sauna, dipping in a tranquil lake and trying some of the in house bodywork therapies: Thai Yoga Massage, Craniosacral Therapy, Full Body Oil Massage and Meditation Floating Tank. Restorative or dynamic Partner Yoga flows connected with one or more yoga friends. Helps you stretch deeper than you usually would, build strength in supportive way and cultivates the ability of listening, communication skills and interpersonal connection. 3 vegan meals are provided by Shamabala daily: breakfast, lunch and dinner. “The kitchen is the heart of Shambala. We just love to make delicious vegetarian food for you. We not only use the best possible ingredients, including organic products, but we also take care of food combinations to ensure that you are in top energetic shape all throughout the retreat. Many people have felt throughout the years, that one of the peak experiences of Shambala has been in the kitchen! We have chosen to have an open and warm feeling in the kitchen where food is prepared amidst singing songs, laughter and creativity that comes from the navel and the heart. On the menu selection process we inspire ourselves in the Ayurvedic tradition of food preparation and proper food combination. “I study many styles of yoga and handstands from the inside out and transform weaker areas in one’s yoga practise to one’s greatest strengths …always expanding with passion.. I naturally embodied yoga in a very lucid manner since childhood and delight in the play of form. Though the asanas came much later… I left a life that included a ‘career/ work/ hedge fund lawyer’ to one where I live my Love. My Passion guides and informs every action and this ‘all-encompassing vision’ creates love and absolute joy… but most important is the Universality of what I do. Ieva WildLoveBeamer is a yoga teacher, teacher trainer, mother & MSc. Clinical Psychology and Mental Health student ieva Wildlovebeamer. “I created the Wild Love Beamer to enable me to create bonding experiences through yoga. I believe that at the very core of everything we do in life is driven by the deep need to belong, to love and be loved. Nevertheless, this need has a challenge in its expression in the modern world. Wild Love Beamer fulfills this basic human need to the wide range of communities from corporate world to families worldwide. Dino is our reliable AcroYoga base, and is a certified AcroFit (AcroYoga.org) trainer. He offers a calm and playful approach to teaching, and in AcroYoga leads by example to base partners of all shapes & sizes! Check in is 4pm on Tuesday 10th July, check out is 3pm on Monday 16th July. Shambala is situated 5 minutes from a town called Skinnskatteberg, 2 hours north of Stockholm in Sweden: http://www.shambalagatherings.com/. The nearest airport to Shambala is Stockholm Vasteras. You can fly from all over Europe to that airport with the low fair airline http://www.ryanair.com. From Vasteras airport, you can take a taxi to the train station in Vasteras and from there take a train to Skinnskatteberg. To view train times, visit this website http://www.sj.se. The second nearest airport is Arlanda airport. This is the main airport in Sweden. From there you can easily take a train all the way to Skinnskatteberg. Again visit http://www.sj.se for train times and information. If you are coming from Stockholm, please take road E18 towards Oslo. After having passed through Vasteras, take a right on rute 66 towards Ludvika. After about 30kms, take a left on road 233 towards Skinnskatteberg. Right before arriving at the center of town you will see on your right a company called Team Däck, turn right at this point and follow the dirt road to Borntorpet. If you are coming from anywhere else in Sweden, please check http://www.eniro.se/ for maps. 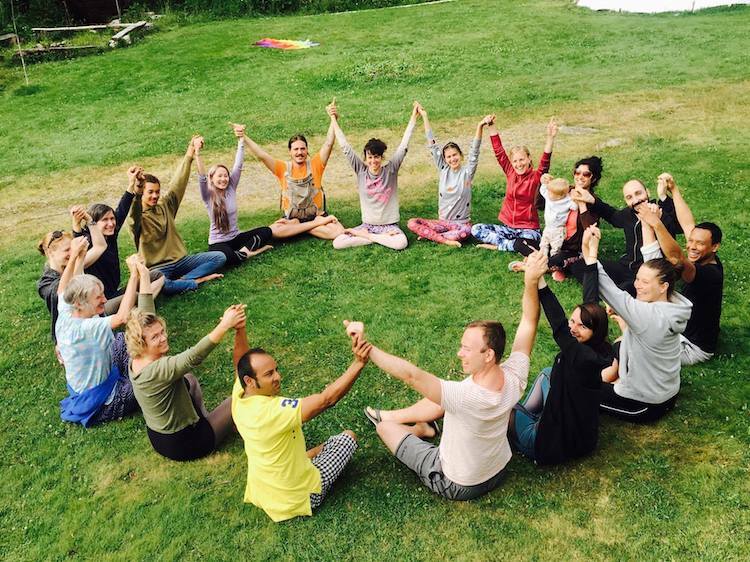 Wild Love Beamer facilitates mindful human connection through team-building, private events and yoga holidays worldwide. Subscribe to get the Wild Love Beamer newsletter delivered right to your inbox! © 2012 — 2019 Wild Love Beamer. London & St Albans. All rights reserved.